Miracle Rock is located in the area of Glade Park just off of 9.8 Road. Miracle Rock is an 84 foot tall, 12,000 ton, massive boulder that is perched on top of an area that is only 1 foot wide. When first approached the rock looks precarious enough to stir feelings of trepidation. Miracle Rock has long been a popular destination for school field trips and family picnics. To get to the Miracle Rock trailhead drive up to Glade Park by either the Little Park Road route or via the Colorado National Monument. Drive west on DS Road from the Glade Park store for 8 miles and turn left on 9.8 Road. 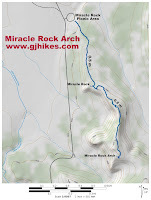 There is a sign at the turnoff onto 9.8 Road for Miracle Rock. Follow 9.8 Road for 1 mile to the trailhead. There is a nice picnic area at the trailhead. 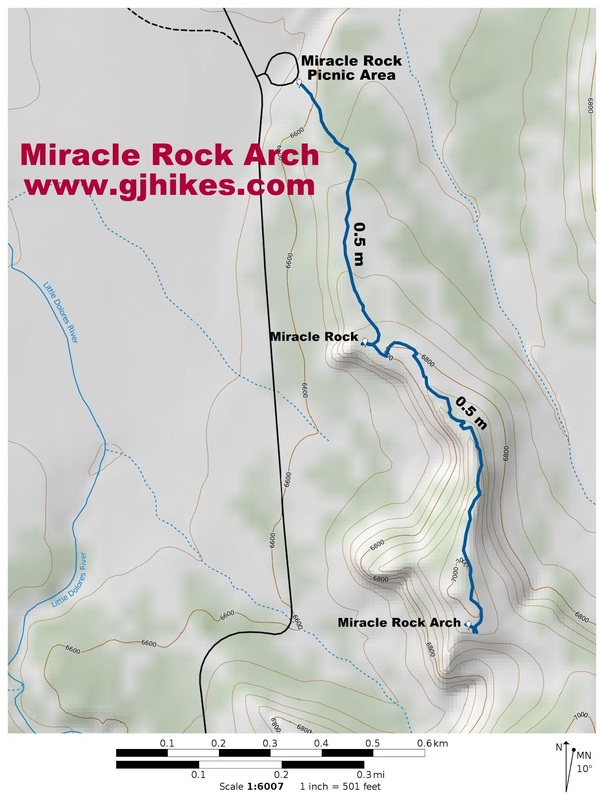 It is a little difficult to tell exactly which way to go through the picnic area to pick up the trail to Miracle Rock. If you head right through the middle of the area you should intersect the main trail. The sign at the trailhead that says that Miracle Rock is at the end of a 500 yard marked trail is a little misleading. The distance is more like a half mile and at present there aren't any trail markers. Portions of the trial are lined with rocks so that might be what they are referring to. Once you get through the picnic area and find the main trail it is well worn and easy to follow. The trail heads up the moderately steep slope of the ridge. Miracle Rock is perched at the top of the ridge overlooking the Little Dolores River valley. The rock performs one heck of a balancing act. It looks like a good puff of wind would topple it right off of its perch. The most amazing aspect of the rock is that it doesn't seem to be part of the ridge but is simply sitting on it. Looking at the rock from side it appears from the crack that there isn't a solid connection between the rock and the ridge. You can even see all the way under it in the middle. The area around the upper ridge has some pleasant alcoves and other places to enjoy exploring. There are a few game trails that lead off to the easterly direction if you choose to do a little more hiking. Middle school kids used to camp here for an overnight field trip. The area is called a 'Picnic Area' but there aren't any signs that say 'No Camping'. Miracle Rock is a very nice short hike that is well suited for smaller children if you keep them in tow around the edge of the cliff. Once you see it you might consider yourself lucky to have gotten there before it fell over. If you would like to see it for yourself then all you have to do is 'Take a hike'.